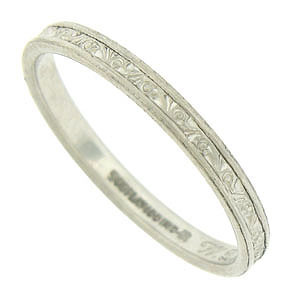 This romantic platinum vintage wedding band is engraved with an elegant floral pattern. The wedding ring is engraved "WDL and MED 5-9-1943". The ring measures 2.13 mm in width. Circa: 1943. Size 6. We cannot re-size.